2019 CAPRI PAINTING HOLIDAY. FABULOUS HOLIDAY IN THE MEDITERRANEAN. CAPRI, ITALY ART HOLIDAY 2018 & 2019. A beautiful island just waiting for you off the Amalfi Coast in Italy. Painting/drawing course in the open air. Join us today for an unbelievable art adventure. On this art holiday, you can choose to paint or to make it a drawing holiday in Italy, or do both. All artistic levels. Watercolor, acrylic, oils, drawing, pastels, gouache. Sunday to Sunday on the island. Airport welcome at Naples Airport. 6 days of tuition, painting/drawing in a small group. Guiding by tutor to stunning painting sites. You and your group will be taken on jaw-dropping art excursions. Painting spots include exciting places like Monte Solaro and its breathtaking views, Belvedere Punta Cannone (Faraglioni di Capri), Marina Piccola, Casa Rossa in Anacapri. Accommodation: Single room, 7 nights on the island of Capri, Italy. Medium: This Capri art vacation is a multi-media art holiday. This includes watercolor painting holiday, any drawing media, hard pastels, gouache, acrylics and oils (although slow drying times and difficult portability make oils a tricky medium on painting holidays. A wet carry case is a must.) Whichever medium you decide to work with, you will enjoy painting Capri in Capri. Exceptional beauty with an extra-special Mediterranean authenticity is what awaits you. The tutor will meet the group at NAPLES AIRPORT, and accompany guests to the FERRY, which will arrive in CAPRI. Everyone will be getting great views already! Once the luggage in place at the accommodation, and all are freshened up and rested, we'll go out and have dinner. Every day there onward will start with an ‘at home’ breakfast where each person will take care of his or her breakfast content. Late breakfast with a relaxed morning at the house/condo. Lunch and afternoon painting at the charming and pittoresque MARINA PICCOLA. We’ll be painting its splendid scenery by the beach. Group dinner at a local restaurant. Late morning visit to the famous Swedish physician Axel Munth's VILLA SAN MICHELE. (From The Story of San Michele, published in 1929). This villa, 327 meters above sea level (no hard walking to get to it) is known in Capri for its panoramic views and for the villa itself. To die for. Villa San Michele's gardens are adorned with fabulous relics and art work dating from Antiquity and ancient Egypt. The villa’s gardens from which you can see the Vesuvius volcano, are now part of the Great Gardens of Italy. On the way back, you will most probably want to stop at the shops; one of them being THE LIMONCELLO (a lemon drink specialist). Another is L'Oasi Ceramiche (gorgeous local ceramics). View from Villa San Michele, Capri. Afternoon painting session spent in ANACAPRI, painting/drawing LA CASA ROSSA, a historic building of eclectic style located in the heart of Anacapri. It is characterized by its red Pompeian color and was built between 1876 and 1898 by American Colonel J.C. MacKowen, who collected archaeological finds of different origins. The Red House today hosts a collection of beautiful paintings that represent different views of CAPRI between the 19th and 20th centuries. Late morning: Group and tutor will go up MONTE SOLARO, it is the highest point of the island (589 m) which we'll reach by a very entertaining chairlift (don't worry, even 8 year-olds take it!) The views are guaranteed to leave you speechless. Photos will speak for themselves on this one. This Caprese mountain contains the "Fortino di Bruto", a blockhouse used in battles between France and Britain and France in the early 19th century. Monte Solaro is characterized by its grand slopes which rise over the eastern and western sides of the island. Lunch and afternoon painting at Monte Solaro. Free time after the afternoon painting/drawing session. Day 5 will be spent painting and sketching a still life and vegetation at the villa with a suggested home-cooked lunch. A simple grapefruit tree (or other trees) can prove to be greatly entertaining and restful for a wonderful afternoon drinking wine and chomping on chippies! Afternoon 15 mn walk up to PUNTA CANONNE BELVEDERE to reach spectacular view (simply heavenly eye food!) where we'll paint the famous rocks that often represent Capri, the FARAGLIONI DI CAPRI. Back to town center by about 5. At mid-morning, we will head for MARINA GRANDE for a major part of our painting day. 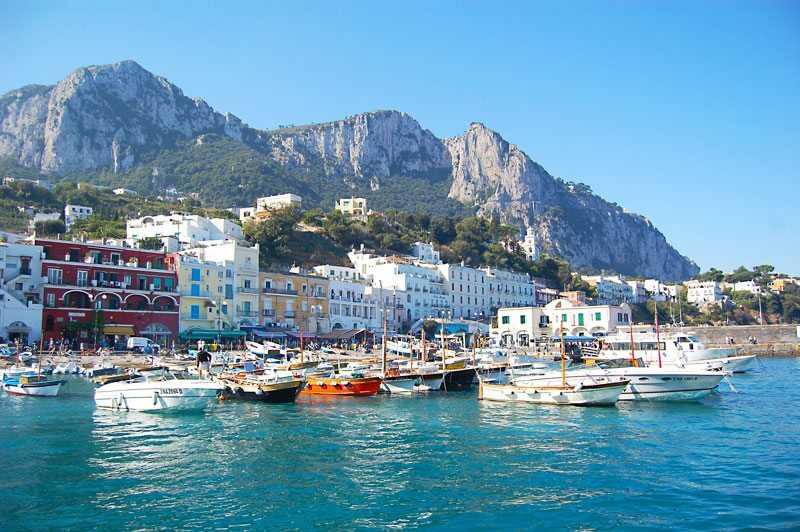 From the ancient fishing port, you’ll be able to capture Capri’s architecture with arched windows, its colors, its odd-looking taxis, its cliffs and so on. Marina Grande, situated on Capri’s southern shore, was used by emperors Augustus and Tiberius. Marina Grande was the first place where Greeks arrived at the Campania region in Italy. Some Capri women are still today known for their Greek features on the island. Group lunch at a restaurant at the marina. Free time at about 4:30. Ferry back to mainland Italy with group and tutor. Groups travels to the airport. Goodbyes. Would you like to contact us about this 2019 Capri art holiday? Simply fill out the form below. Thank you. Please note that although you do not need to be an athlete to join this painting holiday, you will need to be able to walk without strain at a normal no-rush pace anywhere from 15 to 20 minutes at a time to get to places. It is also frequent to have to walk up and down steps on the island of Capri. Planning your Capri Painting/Drawing Holiday. What’s not included? Traveling to the island of Capri. Shared taxi (£6 pp). A few bus tickets on the island (£1.50 each). Meals (budget depends on what you order, etc. You can also make your breakfast and some at home meals). Entry to Villa San Michele (£7). Chairlift to Monte Solaro (£10). You've been looking for a painting or drawing holiday on the very island of Capri? Well, this is it! On Azenart's Capri art holiday, you’ll be blown away by this awe-inspiring authentic Mediterranean island with its beaches, beautiful cliffs, hills and typical colors and flavors of the Mediterranean. You’ll want to paint or sketch in plein air until you drop! An island so beautiful you won’t know where to look first. Join us for this unforgettable creative adventure. We can accept up to 8 participants on this Italian painting/drawing trip. This Capri Italian art holiday is a watercolor holiday, but also an acrylics and oil painting holiday, and is generally called a multi-media art holiday.